Researchers have developed mouse models that mimic human colon diseases such as inflammatory bowel disease. To date, the gold standard for evaluation of colonic inflammation in these models is to euthanize the animal for histopathological analysis. Recently, state-of-the-art mini-colonoscopes for mice have been developed, so now an alternative to euthanasia exists. High quality pictures and biopsies of the mouse colon can be obtained with this equipment allowing for the accurate recording of disease progression and reducing the number of animals used. This technology is in its infancy and many aspects of the experimental technique must still be reviewed. 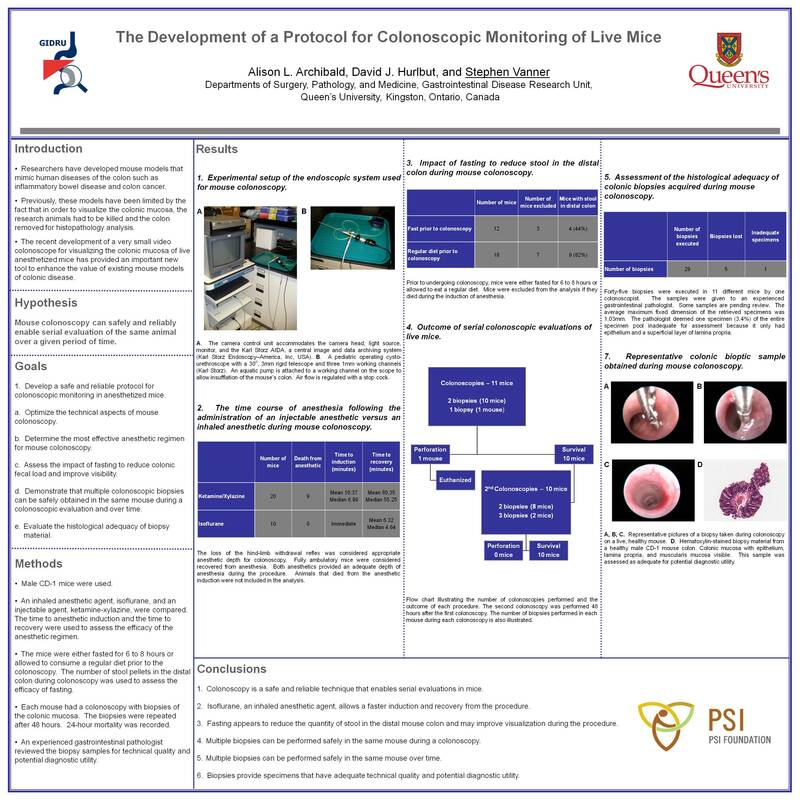 In this project, we describe a protocol for mouse colonoscopy and expand on the existing literature by determining the most efficacious and safest method of anesthesia, the impact of fasting the animal prior to the colonoscopy, the usefulness of a bowel preparation, and the safety of multiple biopsies in the same mouse over time. The protocol can be performed in approximately one hour.